Right: The goal, stacks of folded and collated sheets ready to bind into books. These signatures are approximately 6-5/8 x 9-5/8 inches and make a wonderful size for a journal in portrait orientation. Events keep intervening and keeping me from binding the next batch of Nideggen books, so I don't have a new photo of books made with this paper. 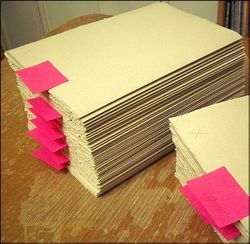 But if you want to see finished books made with this paper check out my January 28, 2009 post. NOTE: this post assumes you have working knowledge of handling a bone folder to tear a folded sheet of paper. Also always do a test on cheap bond first to make sure you understand the instructions. I’ve made every effort to be as clear and thorough as possible, but I’m used to doing this LIVE with people listening, so do a run through first just to make sure it all makes sense before you touch your expensive paper. (I have a note on how to practice at the end of this post.) Also, I find it useful to always have a sheet diagram on hand—and I've been doing this for decades. A sheet of paper has two distinct surfaces, a front and back. If you hold it up to the light and read the watermark (if there is a watermark on the paper) you’ll be able to quickly tell which side is the front or back of the sheet: the watermark will read correctly when you’re looking at the front of the sheet. Many papers have little difference between these two sides and you can fold and collate into signatures for your visual journal without any thought to the final order and arrangement you give them in those signatures. If, however, you are working as a visual journal artist and you enjoy working across the spreads in your journals, it’s important to have the same surface on both sides of a page spread. To ensure this will happen you have to pay attention as you fold and tear your sheets (or cut your paper if that is your preference). I’m going to walk you through this process with one of my favorite sheets: Zerkall Nideggen. I am using the 38 x 25 inch sheet. This is important to note. Not every vendor carries this sheet size. If you get a 22 x 30 inch sheet you’ll need to determine the grain direction of that sheet and make an appropriate tearing plan. Left: This diagram shows the grain direction and division of the full 38 x 25 inch sheet that we are discussing. "A" in the screened box marks one of the final sheets we are aiming for (It will be folded at the dashed line to become part of a signature). The dashed lines throughout the diagram show the final folds. These are parallel to the grain direction (which runs with the 38 inch side of this sheet). The solid lines are tear lines. At the right of this diagram there is a numbered list which gives the basic instructions for folding and tearing this sheet. Note that the instructions listed on this tear diagram ARE NOT THE SAME as those listed in this article. The instructions can be used with the same result, but I wrote these longer instructions after teaching a class to work in quadrants and that seemed to work better for them. I have placed the full diagram here because I wanted you to see how I keep my records for myself. When I pull this diagram out of the computer I can tell immediately how many signatures I'll get for this size journal, and how to proceed in tearing a paper I'm familiar with. (I right away start automatically organizing surfaces.) I find that students new to binding have difficulty folding and tearing narrow strips. If you don't, have a PRACTICE with that approach and do what seems most comfortable to you. One of the reasons I like to use the 38 x 25 inch sheet is that I can tear it down simply by folding repeatedly in half, and end with a 6-5/8 x 9-5/8 page size. This is a great size to work with. You can see this in the diagram above. It is a very quick and easy tear process, even if you are paying attention to matching your surfaces. With other sheets I would have to tear off several inches on each side of the sheet (height and width) as waste, before I got to a core piece I could simply fold and tear to the end size I want. Yes, I often do this. When I want an 8 x 8 inch book I have to look at ending with 16 x 8 inch sheets that can be folded into a signature. The grain has to go with the spine direction so if I were to tear those sheets from the 38 x 25 inch sheet I would have to take nine inches off the bottom of the sheet (i.e., subtract 9 from 25 to get 16 inches width for the final sheet) and I would have to take 6 inches off the vertical edge of the sheet because 8 into 38 goes 4 times for a total of 32 inches, with 6 inches left over. Those strips would have to be removed first, and would be wasted (unless of course you can use them in some other project, or keep them for making very small books, which I recommend). Today we’re going to concentrate on tearing the paper down as is, without waste, and match those surfaces across the spread. Note that smooth and rough are relative terms. With this paper you might actually feel that one side is grainier than the other, or more textured (i.e., the wavy laid pattern is more noticeable to your touch on one side of the sheet), or have some other way to describe it. Substitute whatever descriptors you want, just be consistent. I’m going to continue to use smooth and rough, simply because it’s the way I set up the labels on my illustrations when I did them three months ago! You might want to think in terms of front and back. Right: this is the first tear. Even in the bad lighting in the photo you can see that the sheet on the bottom has a different “color” than the sheet on the top. On the bottom sheet you are seeing the front of the original sheet, and on the top sheet you are seeing the back of that sheet, because you folded it in. 2. Turn your stack of two to be landscape orientation again. Now you’ll have to start paying close attention. Sometimes you’ll be folding sheets so that they fold towards you, sometimes away, always so you can keep the proper surface where you want it. Note: while I write about having a "stack of paper" in these instructions be aware that I only have one sheet of paper on the table at a time. As that is torn down and those pieces become a stack I turn the stack in the orientation described, but I always push the stack OUT OF THE WAY of my folding and tearing. You do not want to fold and tear one piece over another because you can depress and mar the surface of the piece of paper that lies beneath the one you're working with. Also you want to handle the paper as little as possible (washing your hands before beginning the process to remove dirt and oil from your hand). Handling will change how the surface accepts your media; oil from your hands will repeal media, and so on. 3. The next sheet in your stack of two had the rough side showing. You want to fold it so that the rough remains on the OUTSIDE of the folded sheet, so fold it so that B goes BEHIND to meet A. Crease, tear, and stack with your other sheets. (This tear is also with the grain.) Your stack, if fanned out slightly would show a smooth, rough, smooth, and rough surface. 4. Turn your stack so that it is landscape again. Of the four sheets in your stack, two will fold towards you and two will fold away from you so that the surfaces can be maintained in proper orientation. It will be every OTHER sheet, that folds the same. So the first sheet you will fold in on itself (rough inside) and crease and tear and set aside. 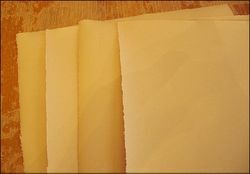 The next sheet you will fold BACK on itself so that the smooth side of the paper stays on the outside of the fold, crease, tear, and set aside. The third sheet you will fold as you did the first sheet in this stack: you will fold towards you so that the rough side is in the inside of the fold. Crease, tear. The last sheet folds back on itself as the second sheet in this operation did. This means that you are folding these 4 sheets in your stack so that the SMOOTH side of the paper is always on the outside of your fold. When you put them together in the stack you will have alternating rough, smooth, rough…to smooth facing at you on the top. This means that in the entire resulting stack smooth surfaces face smooth, rough face rough. Notice that for these tears there will be some resistance. This is because you are again tearing AGAINST THE GRAIN. 5. You will now have a stack of 8 sheets in front of you, all properly organized. These sheets will fold and become the pages of your signatures. You will be making two signatures from the large, full sheet you started with as shown in the beginning tear diagram. Each signature will have 4 sheets in it (giving you 16 pages in each signature). Turn your sheets landscape orientation again. This time you will be folding BUT NOT TEARING!!!! The fold will be in line with the grain direction, which is what we want for our signatures. Starting with the first sheet and fold it closed by folding it towards you. Smooth surface folds to touch smooth. The second sheet is rough side up. Fold it closed by folding it towards you also so that rough touches rough. The first sheet will sit inside this fold. The rough side of the first sheet is on the outside of that fold so rough of that sheet will face rough of the second sheet. Fold those first four sheets towards you as described. Keep them lined up on your table. Then insert the folded first sheet into the second, into the third, into the fourth, as shown in the next diagram. This is how you collate your signature with same surfaces facing same surfaces. Left: How to fit the folded sheets together as you fold them in order. If your stacks have been ordered throughout the folding and tearing process this final step is a breeze. 6. Continue folding the sheets in the same manner, inserting them together in groups of four as discussed in item 5. Watch for the watermark and make sure it gets collated so that it appears at the base of a page and not upside down at the top of a page. A final check, which works for this paper, is that the edges of your pages will bend slightly in different directions (in and out, a slight bowing) because of the qualities of this paper. If they all bend at the edges in the same direction then you will have split surface spreads, not desirable for visual journaling. 7. Progress through sewing as you would for whatever structure you are making. Again, Why Bother with All This? Well, if you take these simple steps as you fold and tear the same surface of the paper will face itself across the spread. This means that when you work in your book if you are painting for instance, the paint will react in the same way regardless of which page of the spread you are on. There will be no inconsistencies across the spread. 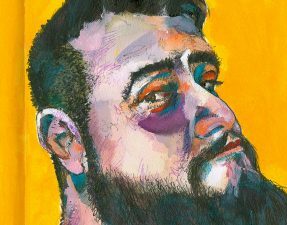 This will be less frustrating for you as an artist looking to capture the moment before you, rather than struggling to match the “look” of media application across the page spread. Be aware that not every paper that looks the same on the front and the back reacts the same to media. For instance, some papers are surface sized only on the front of the sheet. They may look identical in texture on the front and back of the sheet but if you try and paint on the back sheet you'll get vastly different paint handling/response. To paint across a spread where the surfaces of such a paper don't match would look very odd, even for the most skilled of painters. 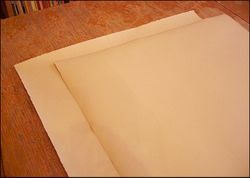 Other papers, such as Canson Mi Tientes, have a clear difference between the texture on the front of the sheet and on the back of the sheet. You could pretty much tear them up without paying any attention and then sort them as you folded them because the visual aspect is so apparent. I recommend, even for such sheets that you get into a pattern with your tearing so that you save yourself time in folding and collating, and in squinting to see differences in less than ideal situations. If you think your head is going to explode after reading this just take a deep breath. It is quite simple, which you would see if I could show you this in person like I show my students. Now that you are breathing again, here is something that I would advise you to do: Practice on bond copier paper. Take a sheet of bond paper and draw colored ink lines across one side, or use a sheet of copier waste that has text on one side. Decide mentally that the line/text side is your rough side and the blank side is your smooth side. Then follow the above instructions for folding and tearing, stacking, and repeating. Don’t worry about the grain direction of your bond copier practice sheet. All that matters is that you use a sheet that isn’t square so you can place it in landscape orientation and work through the process. You’ll feel grain direction when you work with the actual Nideggen (or other art paper). Practice at least a couple times. Then, the day you are going to tear your art paper practice once again just before you do it so that you understand what’s going on. There are a lot of points in this tearing process that you could adapt differently, you could tear strips instead of quadrants, etc. But for your first time it will be easiest if you simply follow this plan. Once you start to tear paper the rest of the world doesn’t exist. Finish one sheet at a time before you go on to anything else, any interruption. If the phone rings ignore it. I guarantee that if you return after even a 10-second break your mind will be spatially confused and you’ll be frustrated. Don’t go there. You don't want to get confused and tear up a $4 (or more) piece of art paper incorrectly. If you have a lot of sheets to do for one size of journal, do them all at one session, even if it is over several days (always stopping only after you finish a complete sheet). This will give you uniformity in tearing. If you are tearing off waste strips to get a special size journal, save your waste strips and use those to measure from, again for uniformity. And before you tear off the first waste strips measure the full sheet, because sometimes papers aren’t exactly the size we’re told. If you think you have 25 inches to work with and tear off 9 inches, but actually only had 24.5 inches, then your final book measurement will be off. Discover this before you do your first sheet rather than your 10th sheet. And also check that all your sheets are the same rough size! I would also advise you to tear and fold all your papers before cutting any boards for covers. Wait until you have the actual folded signatures before you start thinking about other measurements (and in some structures wait until you have the sewn textblock). It will save you frustration and waste, and fiddly fine trimming which never works anyway. In every class I have ever taught there has been one student who, either through impatience or a sense of strength has bundled his or her sheets together, folding and tearing more than one sheet at a time. Resist the temptation to do this. Too much can go wrong and instead of mis-tearing one portion of a sheet you have mis-torn all the pieces of it, perhaps rendering it unusable. Get into a meditative mode about the paper tearing portion of the book binding process. Enjoy the quiet moments when the only noise you hear is the fold and crinkle of the paper, the smoothing of the bone folder, the zip of the tearing fibers. Take time to position hands and fingers and bone folder correctly so that you get a good tear (I'll hope to post a video of this some time soon if you don't know how to do this). You'll actually learn to hear a good tear and feel it with your eyes closed. There is great reward and enjoyment to be had in simply working patiently through this task, and in accepting the little variances that your humanity interjects. By tearing and folding each sheet and portion of the sheet at one time you will also get, through to the final signature, a product that is crisper and folds tighter (this also makes it easier to sew). A couple times while teaching 4th graders (it is always with 4th graders so this must have something to do with the developmental process at that age) I've been asked, and urged, and even double-dog-dared to fold and tear more pieces at one time. Typically I've done this because I've been talking and watching the students and I've got to catch up in my sample to show them the next step. I'm not proud that I'm succeptible to double-dog-daring, but I have to admit that I'm relieved to say it has never ended badly. But I remind the students of all I've said here, and also that I'm strong, and my fingers and hands are strong, and I have practiced technique. With all that going for me I can get it done. I urge you, however, not to take the risk. Paper is too lovely. If you do take the risk you have to be willing to live with the potential waste. It's more fun and relaxing to just get into the motions of tearing one sheet at a time, folding one, tearing, and so on. 1. You can follow these instructions with other papers, once you determine the grain direction for tearing. I recommend that you make a little diagram for yourself showing the tears and folds. Save it for the next time you tear the same paper. I have tear diagrams for over 75 different types of paper. For some favorite types of paper that I make into a variety of journal sizes I have 4 or 5 tear diagrams. I do not like to repeat work. I simply go to the computer and call up the diagram. It saves vast quantities of time. Additionally I can tell at a glance, because I have noted it down, how many full sheets I need to make a book with "x-number" of signatures. Armed with this information I can go to the paper store and buy exactly the number of sheets I need for my own binding or for a class I'm teaching which uses a particular paper torn to a certain size. Where Can You Purchase Nideggen? Writing on June 3, 2009 there are a number of vendors for this paper. Do a Google search if you want exhaustive information on suppliers and costs. Be aware that not all vendors sell the 38 x 25 inch sheet. it is tough, sturdy, and opaque. 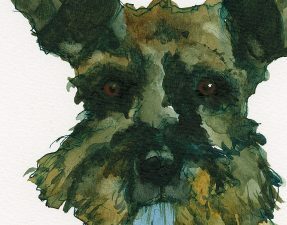 It will take wet media (I like to use watercolor and gouache on it) and it is excellent for pencil and ink (dip pen is especially fun on this surface). 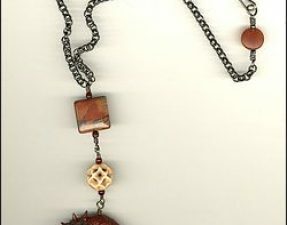 It has a wavy laid pattern that gives interesting qualities to your artwork, especially graphite and colored pencil works. The tan color of the sheet is enhanced by fiber flecks. 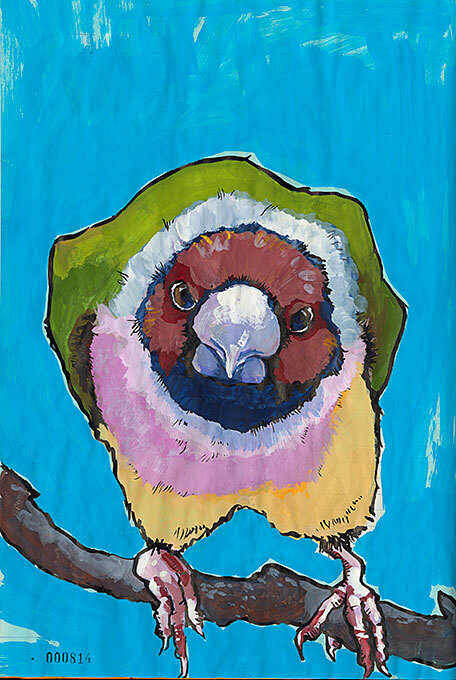 The tan color of the sheet also makes it a wonderful paper for colored pencil work or gouache. All in all it is a yummy sheet to work on. Test it out for yourself. Just looking at those paper stacks makes me happy. wow, roz, thanks for this. I still have the Nideggen sheets I got in the group buy and I’m glad I haven’t torn them down to book size because now I’ll have this to go by. Elizabeth, I’d be happier if they were turning into books! I haven’t had any binding time in over a month because of a sprained ankle and elder care issues! But I have visions! Karen, if you want to make landscape books small like the ones you made in my “Not your father’s casebound book” class you can tear them another step so that you are folding them in half in the height direction, and tearing, before the final fold. If you look at the tearing diagram, instead of having 4 panels across you would have 8 panels across. Every sheet would give you 4, four sheet signatures (16 page signatures), instead of just 2. You can measure from the textblock to get final dimensions for your boards. I made a couple of these 1/2-size ones in the last batch and they will be nice for trips when weight is an issue, or when I want something smaller. But I know you love that smaller size so I thought I would mention it. What a wonderful reference, thanks for sharing these clear directions and your positively poetic rationale. Meliors, I don’t know if my rationale is poetic (but thanks), but I do like things the way I like them. And since I’m the one who’s making my books I get to have them the way I want them! I think I spend way, WAY too much time thinking about this stuff. (But I’m glad you enjoyed it!) I guess it keeps me out of trouble. Roz, Thank you so much for taking the time to post these directions. I’ve taken a class in making simple folded/pamphlet books and just completed a book with stab binding. I hope to soon move on to more complex journals and this information will be invaluable in preparing the signatures. ( I tried out the Nideggen paper yesterday and like it a lot. Fortunately, the UO Bookstore sells the larger sheets.) Thanks again – your blog is a treasure! Sharon, I’m so glad that you leave near a store that sells the larger sheets of Nideggen! You are very fortunate! Have fun with your bookbinding. Thanks for reading!